John was a Navy hospital corpsman. He worked the general sick bay, managed a carrier O.R., and treated heat rash, eczema, and dyshidrosis. Having been raised in Arizona, and living there since the fifties, I am quite knowledgeable about the fear that can come with the term, coccidioidomycosis, or Valley Fever. Cocci, as it's frequently called, is a fungal infection common to specific areas of the United States. 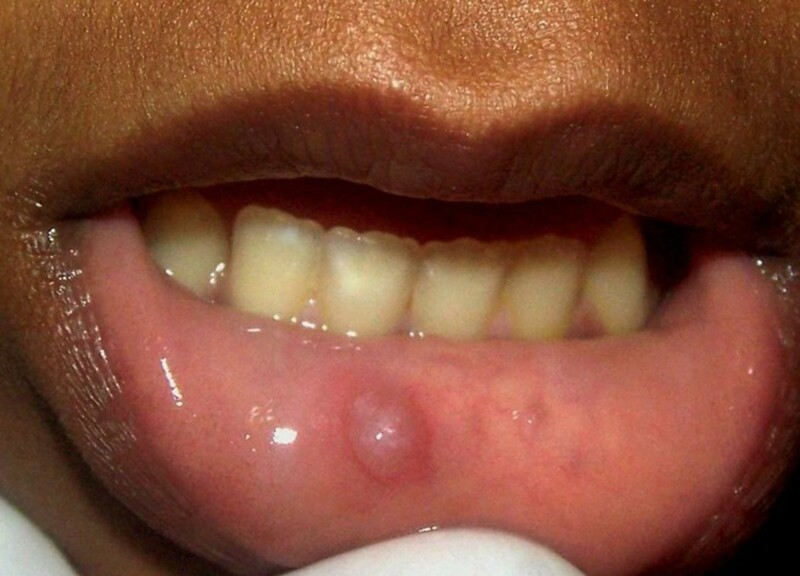 It has long been known to those who have lived in the desert locales, particularly the first settlers and prospectors, but it's frequently an unknown disease until one comes to reside in the area. V.F. is a pulmonary fungal infection that produces fever, fatigue, and other symptoms, all not necessarily present. Other names for this condition are: San Joaquin Valley Fever, Desert Rheumatism. By way of a somewhat slow introduction, let me relate this bit of personal history. When my family moved to the desert Southwest in 1954 (Arizona specifically), there was much about the place that was new and mysterious having come from green Pennsylvania. I recall my mother asking me in the 1953 Chevrolet station wagon in route to Tucson, Arizona, "Are you excited about seeing cowboys and Indians?" Actually, I hadn't even thought about that. Now I was really anxious. As soon as we stepped foot in our first home in Tucson, Arizona, it is my clear recollection that my mother had a saying which she learned from neighbors. That was that, "Remember, it is dusty here - you could dust every day and still not clean up the dust. Just don't move anything!" 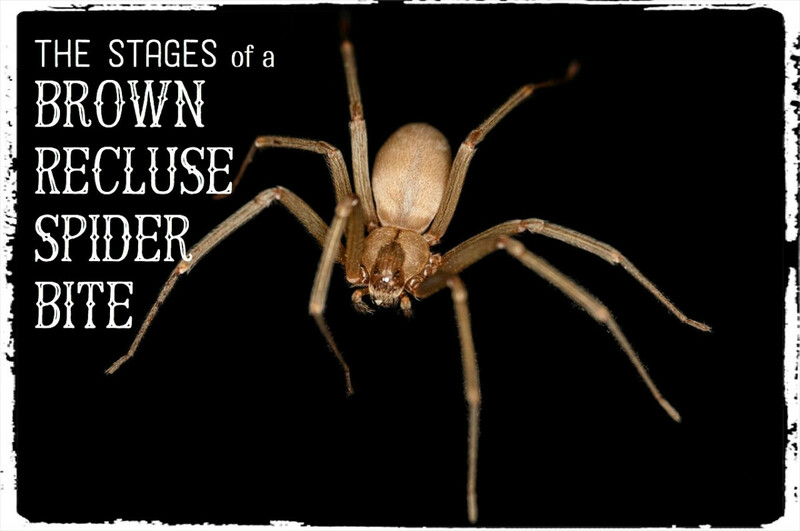 Oh, there was much more to our initial impressions and to my personal stories as a five-year-old moving to a new place with strange stuff like saguaros, scorpions, rattlesnakes, black widows, and Gila monsters. But the key thing now, at least for the women, was the dust generated in this dry, rather desolate southwestern area. This dust is the source of the fungal spores that when breathed in can cause San Juaquin Valley Fever. So now you know that the desert Southwest is a dusty place. Arizona and the rest of the southwestern United States is very dry. It is so dry that the United States Air Force has chosen it as a place to mothball out-dated aircraft. There are literally hundreds of aircraft mothballed in Tucson, Phoenix, Kingman and other areas because of the fact that the desert Southwest is a dry safe place, hence, negating the need to worry about metal corrosion. Aircraft dating back to the 40s are being recycled daily because they have been kept in pristine condition due to the dryness. Now let's move on to something perhaps less colorful but in many ways more important especially to those who may be new to the desert Southwest of the United States. The first thing one must remember is that relatively few people are affected by Valley Fever. Most folks, for whatever reason, have an immune system that can beat off any wayward threat by this fungus. 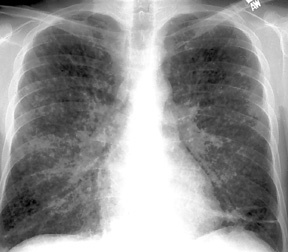 In fact, in many cases physicians will detect a calcified area on the lung on an x-ray which means the patient had the infection in the past. The patient did not know it. Such is the way of Valley Fever. I specifically recall when suffering from a cold and feeling very tired being taken to the doctor. His diagnosis was in fact that I had a cold! But he took an x-ray just to be sure. On this x-ray was a bit of a spiral circular white spot and he immediately recognized it as an old, healed lesion. I had had Valley Fever and none of us knew it. This is not unsimilar to the experience of many newcomers to the dusty valleys of Arizona. In addition to fatigue and a slight fever, sufferers often have joint ache. Serious infections are frequently treated through the vein with amphotericin B (Abelcet, Amphotec). And by way of this information, another slight detour. When I served as a corpsman in the U.S. Navy (1968-1973), I was told by the attending physicians that for some reason Filipino sailors seemed to be more susceptible to cocci. These men were almost all treated with amphotericn B. And indeed, I helped care for a number of Filipino men who suffered from the effects of this infection. I later learned that African American males also seemed more prone. Of note, this was in San Diego, California. 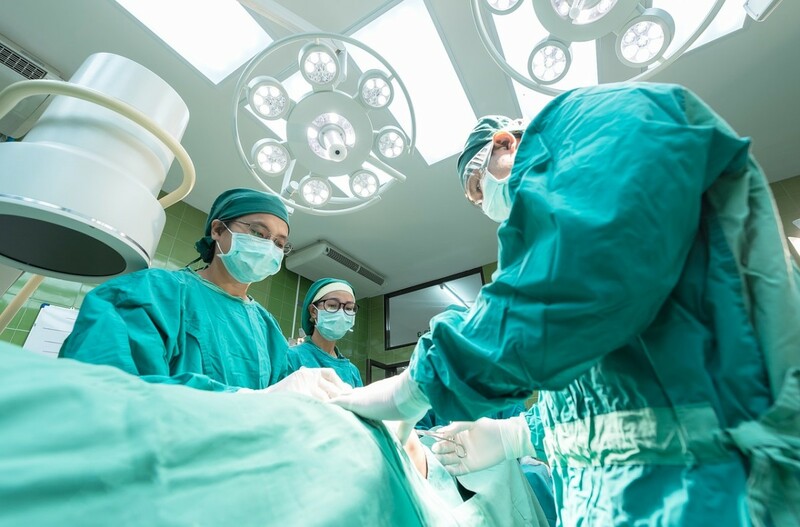 The usual situation is that most people's have one incidence of infection and after their bodies naturally overcome the situation or they are treated by a physician, this initial infection results in immunity for life. Folks who have experienced Valley Fever can be reinfected if their immune systems is compromised in some way. Reinfection could be from another illness or some kind of deficiency. I have known of only one person who has been reinfected resulting in a second bout with the fungus. And, as often quoted from the literature, this is somewhat rare. The best therapy for healthy adults is bed rest and fluids. As is the case with flu and colds, bed rest and hydration help the body fight off the infection and in most cases it resolves itself. Some cases may take months or at times years to resolve. In extreme cases the symptoms may heighten and lessen over years before resolving. Avoid breathing in dirt or dust (especially deep breathing) in areas where Valley Fever is known to exist in the dry soil. If there are dust storms, avoid exercising outdoors. In Arizona, these storms are referred to in their most serious form as haboobs. Valley Fever is found in the Southwest: Arizona, California (California's San Joaquin valley), Utah, Texas, New Mexico, and Nevada. If you have symptoms, check with a doctor just to be sure. It is a disease to be taken seriously, but not necessarily to the level of fret. Do you suspect you have had Valley Fever? I know I have because it showed up on an X-ray. I know I have because my skin test was positive. I think so because I had all the symptoms but got better. I live in the desert Southwest and figured I have. Don't think I have been infected before. Though the breeze can pick up in the evening with fungal spores aloft, the worst times of the year are during summer monsoon dust storms, or, in the case of California, earthquakes. These events obviously stir up the dust. If one has not paid attention to weather reports or looked at the skies, it will become obvious that dust has been agitated because you will start to taste it. That's when I head into the house. 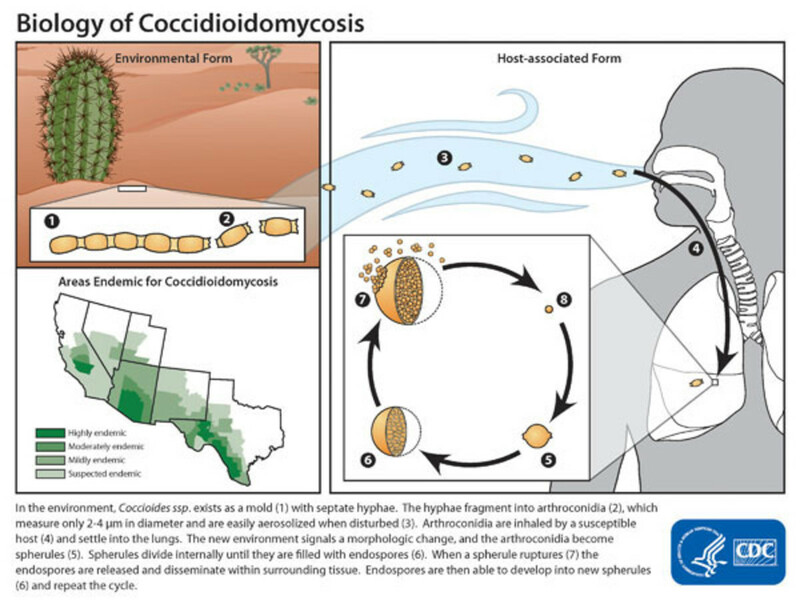 With a bit of care those of us living in the desert Southwest can successfully avoid any serious effects from coccidioidomycosis. And of course, the higher the concentration of spores aloft the greater the opportunity to contract an infection. 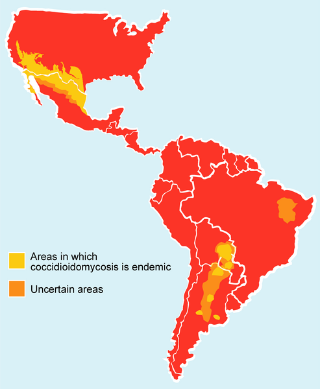 Areas in the Southwest where there is a lot of farming are often found to affect larger numbers of people with cocci. We experience long periods of extreme heat causing dryness. The topsoil frequently looks like powder. In my area of Maricopa and Pinal counties in Arizona, clearing land for new construction results in large swaths of ground turned over with no vegetation. As this will dry out in the heavy heat, it frequently results in heavy dust concentration when the wind blows. There are laws requiring farmers and contractors to till and surface their land followed by water spray. But when activity slows on the farm or the construction sites, the dry tilled soil sits awaiting the desert wind. Not much can be done about that. I wear a mask. One simply stays alert; it is not unlike when walking in the desert. Watch the ground, you don't know what you may encounter! It is estimated that 100 people a year die of valley fever in the United States. In my own area near Maricopa County, Arizona, there were about 6000 cases in 2011. There were about 16,000 cases across the state. Note: Valley Fever is not contagious. With talk about climate change and increased temperatures, scientists have been prompted to investigate the Valley fever fungus a bit more. The expectation is that the desert Southwest will see more movement of people into the area as Eastern climes experience, perhaps, colder weather. At the same time, Arizona and other Southwestern states may experience increased heat with a resulting increase in dry dust accumulation. Hence, there is the need to understand the disease better in an attempt to deal with a possible future increase in cases. This article has been an introduction to Valley Fever. As such, it has focused on a disease which it is hard to describe as positive or anywhere near to that. Yet, having lived in this wonderful land for 50 years (I moved here in 1954 and have lived here ever since save but for 4 years in the military) I can attest to the beauty of this state. Don't let a little old thing like valley fever keep you away! Think about it, 100 deaths is about 0.00033% of the population. You may have a greater chance of catching tuberculosis if you live in a densely populated urban area!? Once you have seen the desert plants flower, and once you have seen the saguaros, the mountains, the valleys, the sunsets, and experienced the weather (did I mention Mexican food?! ), you won't want to leave. The people of the desert are giving; the land is at peace with itself. But when you see a haboob, go inside! I would have said, "Take cover! ", but afterall, it isn't a nuclear holocaust. Diverticulosis or Diverticulitis? Which One Do You Have? Thank you so much for reading my hub. I take your comments seriously, and am thankful for your time. Be well. Very informative hub about Valley fever. I have never heard about this ailment. It's a well written and well researched article and I am sure many who are affected will benefit from this information shared by you.